St Francis is the patron saint of Italy as well as the patron saint of animals, merchants & ecology. The second section of the St Francis Way begins in Sansepolcro, the home of Buitoni pasta and the first town in Italy to have electricity thanks to the hydroelectric power plant which was built in 1906. Leaving the region of Tuscany behind, this section has you entering the region of Umbria. Medieval hilltop towns, lush green forests, vineyards and olive groves will make up this classic Italian undulating landscape. With each step taking you closer to Assisi, the stories of St Francis abound as you pass through the towns and countryside where St Francis spent his time. Arrive into Sansepolcro. This town in the western part of Tuscany is the birthplace of Piero della Francesca and you can view his famous “Resurrenction” in the towns museum. If you have time a visit to the nearby convent of Montecasale will not disappoint. A short 15 minute taxi ride out of Sansepolcro in the opposite direction that you will be walking tomorrow, this peaceful and spiritual place is where when robbers were camped nearby St Francis got his followers to provide them with food. To return the favour the robbers provided firewood to the brothers and afterwards even gave up their criminal ways to join them. Sansepolcro is in the western part of Tuscany and the birthplace of Piero della Francesca. Here, you can view his famous “Resurrection” in the town’s museum. If you have time a visit, the nearby convent of Montecasale will not disappoint. Only a short 15-minute taxi ride out of Sansepolcro in the opposite direction of what you will be walking tomorrow, this peaceful and spiritual place is where robbers were camped when St Francis got his followers to provide them with food. To return the favour the robbers provided firewood to the brothers and afterwards even gave up their criminal ways to join them. The walk today will be relatively easy. Leaving Sansepolcro you will go under the highway and cross the river before going along the flat road through factories, warehouses and farms to Gricignano. Just pass Gricignano you will leave the region of Tuscany and enter Umbria, which is the only region in Italy that doesn’t have a coastline or borders with another country. Passing through the town of Fighille and its swimming pool and outdoor tennis courts you will follow a road with the Stations of the Cross for a short while. Turning off this road and following the way-marked trail you will pass by fields of crops with the hills in front of you coming up on Convento Zoccolanti then gently climb to the picturesque town of Citerna. A unique feature of Citerna is the medieval walkway which is a covered passageway that is perfect for romantic strolls. A must see also is the Church of San Francesco which has a Byzantine wood crucifix as well as a statue of the Madonna with Child that was recently attributed to Donatello, and the Church of San Michele Arcangelo which also hosts some famous work by Italian artists. Today will be a relatively short walk with plenty of opportunities to stop for breaks. Heading out of Citerna you will head down into the valley walking until you reach the highway which you will then briefly follow before turning on to a gravel road. Following the winding trail through a forest and then pass hayfields and woods on the top of the hill, giving you sweeping views of the region, you will come to Agriturismo Le Burgne where you can have a short coffee break. Continuing on the gravel road gently climbing and accompanied by panoramic views worthy of a photo, before descending to the bottom of the valley, you will then pass by arable farms and woods gently climbing a hill before winding down into Lerchi which will provide another option for a break. Heading uphill out of Lerchi through woodlands and peaceful countryside you then come upon Camping La Montesca , another and final option for a break before making the final descent to Citta di Castello. The town of Citta di Castello is built on an old Roman town and the walls of the city date back to the 16th Century. 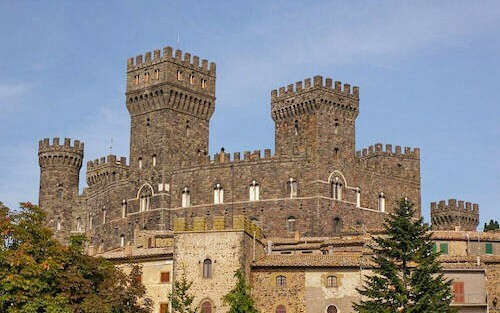 If you have the energy you may want to climb the Torre Comunale which dates from the 11th Century and provide sweeping panoramic views of the area or wander around the Pinacoteca Comunale art gallery which houses medieval and Renaissance art. St Francis is also linked to this town where it is claimed he cast a demon out of a woman. When St Francis met the women and shouted for the demon to leave nothing happened and Francis was embarrassed and left town immediately. When he later returned the woman sought him out to thank him for casting out the demon and saving her. It is claimed that moment of embarrassment aided St Francis in accepting the gift of humility, as it was God’s power and not his that enabled miracles. The walk today although long is not arduous, but to make the most of the day we would recommend that you set out early. Leaving Citta di Castello crossing the railroad tracks you are soon on a gentle climb towards the mountains passing by vineyards and olive groves then coming upon Bar Sasso, the last bar until you reach Pietralunga so you may want to pick up items for a picnic later in the day. Continuing through the undulating hillside, you will come upon a small park which is means you are roughly halfway through your journey walking and makes a nice spot to stop for a lunch break. Climbing then to the summit of Monte Santo Stefano you then begin to descend before then one last uphill climb before descending down into the Carpinella valley and the town of Pietralunga. Here you can visit the Church of Santa Maria as well as wander around the narrow streets and enjoy a hearty meal after a long days walk. Today we would recommend that you start early so that you arrive into Gubbio with plenty of time to explore this popular town. It would also be a day to bring a picnic as there are no services along this section. Leaving Pietralunga the day starts with walking up and down through mountain forests before the vistas open up and you begin a descent down to the valley which is filled with hayfields. Arriving into the tiny settlement of Monteleto you may want to stop at the small parish church in the garden and enjoy a picnic while drinking in the tranquillity of this place. Soon in the distance, Gubbio becomes visible on the mountainside. Walking into Gubbio you may want to visit the Roman theatre which is before the city walls and the centre of Gubbio. This stunning stone hill town at the foot of Mount Ingino is where St Francis talked to a wolf and convinced it to stop killing the town’s people, whom then took it in as a pet and ensured it had plenty to eat. It is said that Francis slept in the Chiesa San Francesco’s sacristy when he visited Gubbio. If this long day of walking has left you hungry be sure to sample some pasta with truffles and porcini mushrooms, a local delicacy. The walk today will see you retrace the steps of St Francis after he initially left his family. While walking out of Gubbio you may want to stop at Chiesa di San Francesco della Pace where the wolf’s remains are buried under the altar. Leaving Gubbio you will pass by a former 12th Century Leper Hospital before coming to the town of Ponte d’Assi where you can stock up on suppliers for today’s walk. 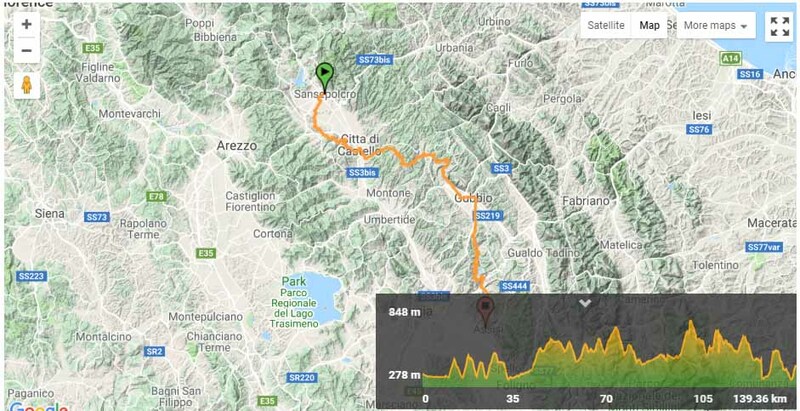 Gradually climbing and then looking back you will be rewarded with expansive views of Gubbio. 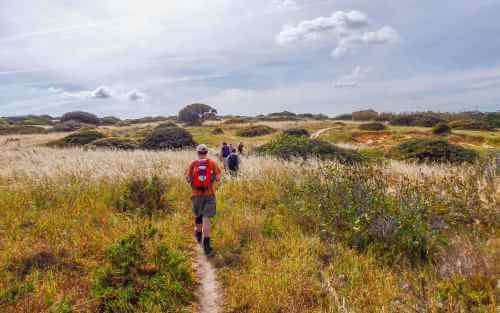 Passing by farms and woodlands you will continue to climb before making your way downhill to the Madonna della Grazie shrine where there is a large lawn and a pleasant place to stop for a short break. From the shrine, you ascend to the 15th Century Eremo di San Pietro Monastery, the after crossing some creeks, you will arrive at the 14th Century Chiesa del Caprignone. Here, there are picnic tables and you can stop to enjoy a break before continuing through woods then crossing another creek before arriving at Biscina your stop for the night. In this small quaint hamlet, you can see the tower that remains of the Castle that strategically overlooked the Chiascio Valley. Heading out from Biscina you will pass the tower that remains of the castle and be greeted with a photo-worthy view of the rolling hills and Lago di Valfabbrica to which will you meander over and down the hillside too. Walking around the lake and then following the river you will come to Valfabbrica where the Monastery of Santa Maria is and this is where Francis sought help after being beaten and left for dead in a snowy ditch by bandits. Continuing through the arable landscape you see the ridge ahead of you that you will cross. Following the ups and downs through forests, you will come to a viewpoint with a wooden cross and for the first time be able to see the Basilica of San Francesco in Assisi, and with a picnic table, you can easily stop for a rest and snack while being surrounded by the beauty of this region. Walking towards Assisi now just before the town you will pass a statue of Padre Pio and then continuing around a hairpin turn you will arrive down into Assisi and the Basilica di San Francesco. Mass is on daily here at 6 pm for pilgrims so it is worthwhile trying to arrive in time for this. Assisi is the birthplace of St Francis and also where his tomb is in the Basilica. 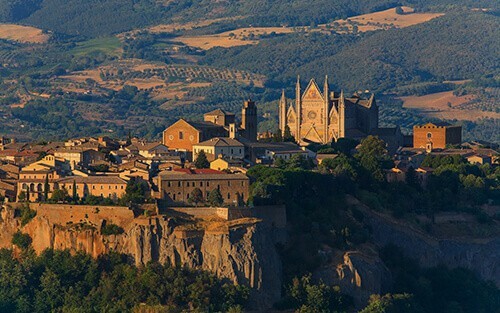 The town is filled with connections to St Francis for you to visit and it may be that you might want to take an extra night’s stop here to have time to visit all these sites and bask in the sanctity of this town. Closet international airport is in Florence, Aeroporto Amerigo Vespucci, with direct flights from London by British Airways and Veuling. From Florence we can arrange a private transfer to the Sansepolcro or you can get a train to Arezzo and then a bus to Sansepolcro. Information on the train can be found on the following website here. Information on the bus can be found on the following website here. The closest airport to Assisi is Perugia and there are direct flights to London with RyanAir. If required we can arrange a private transfer from and to the airport.